This article by Hugh Owen was published in Italian on November 6, 2009, by the Italian publisher Cantagalli under the title Evolution: The Decline of an Hypothesis, with a number of other articles by natural scientists and philosophers from seven countries who participated in a symposium on evolution at the National Research Council in Rome in February of 2009. The 150th anniversary of Charles Darwin’s Origin of Species offers a fitting occasion to evaluate the evolutionary hypothesis from an historical perspective. This paper will show that the evolutionary hypothesis has had a negative impact on scientific research during the past 150 years by influencing natural scientists and medical researchers to resist or reject fruitful avenues of research that conflict with evolutionary assumptions. The examples cited span the entire 150 year history from Origin of Species until today, and include the scientific investigation of “vestigial organs,” “embryonic recapitulation,” so-called “junk DNA” and genetically modified food. An organ serving for two purposes, may become rudimentary or utterly aborted for one, even the more important purpose, and remain perfectly efficient for the other. . . There are, according to Wiedersheim, no less than 180 vestigal [sic] structures in the human body, sufficient to make of a man a veritable walking museum of antiquities. Among these [is] the vermiform appendix. These and numerous other structures of the same sort can be reasonably interpreted as evidence that man has descended from ancestors in which these organs were functional. Science has piled up still further evidence for its case. It has found a number of useless organs among many animals. They have no apparent function and must therefore be a vestige of a once useful part of the body. A long time back these vestigial organs must have been important; now they are just reminders of our common ancestry. One example is the vermiform appendix which not only is utterly useless in human beings but which often causes great distress. It is clear from this description that the appendix sits between the nearly sterile ileum at the end of the small intestine and the caecum at the entrance to the large intestine. Noting that monkeys lacked an appendix but had a developed caecum for the digestion of plant matter, Darwin reasoned that the appendix in man was an appendage of the caecum and that the whole unit had degenerated through disuse as man evolved from an herbivorous ancestor. In this way, Darwin based his evaluation of the appendix on an evolutionary interpretation, then used the appendix as “evidence” for evolution-a classic example of circular reasoning! The appendix is not generally credited with significant function; however, current evidence tends to involve it in the immunologic mechanism. The mucosa and submucosa of the appendix are dominated by lymphoid nodules, and its primary function is as an organ of the lymphatic system. It is now recognized that the lymphoid nodules appear in the appendix roughly two weeks after birth which coincides with the colonization of the bowel with bacteria. The appendix can be safely removed later in life because it plays its most important role in the body’s development immediately after birth and because it is only one part of the Gut Associated Lymphatic Tissue system. The appendix has no known function in humans. Evidence suggests that our evolutionary ancestors used their appendixes to digest tough food like tree bark, but we don’t use ours in digestion now. Some scientists believe that the appendix will disappear from the human body. The extraordinary ignorance of this statement shows how much faith in the evolutionary hypothesis continues to influence leaders in the field of public information, even when the facts contradict their evolutionary presuppositions. But the statement also reflects the degree to which the conventional wisdom pins the blame for diseases of the appendix squarely on the “vestigial” and defective nature of the organ itself, without even considering the possibility that these diseases could be symptomatic of deeper disorders. in his thirty-six years of contact with these people he had never seen a case of malignant disease among the truly primitive Eskimos and Indians, although it frequently occurs when they become modernized. He found, similarly, that the acute surgical problems requiring operation on internal organs, such as the gall bladder, kidney, stomach and appendix, do not tend to occur among the primitives but are very common problems among the modernized Eskimos and Indians. By blaming diseases of the appendix on the defective condition of a vestigial organ, Darwin and his disciples up to the present time have helped to discourage researchers from following the traditional approach of Western natural science and medical research initiated by Hippocrates and the ancient Greeks which looked for the causes of human disease in the defective diet, habits, or environment of their patients rather than in some intrinsic defect of the body or of its component parts. By blaming diseases of a vestigial appendix on evolutionary degeneration, generations of scientists have lost their incentive to ask why these diseases did not exist among non-industrialized societies and to seek to prevent them through constructive changes in diet and life-style rather than by treating the symptoms of the disease through surgical removal. 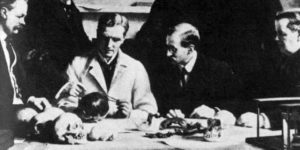 Confidence in the truth of the evolutionary hypothesis has obstructed scientific progress in understanding virtually all of Darwin’s alleged vestigial organs. It would take a large book to document all of them, but one other example will be cited here as evidence that the evolutionary hypothesis has led to diagnoses which are not only false but dangerous to human health. One of the most common surgeries in the world is tonsillectomy, with at least 400,000 per year being performed in the United States alone. For most of the past 150 years since the publication of Origin of Species, adherence to the evolutionary hypothesis has led most scientists and medical experts to regard the tonsils as “vestigial” organs with only a small degree of functionality or none at all. The two primary indications for tonsillectomy have always been chronic infection of the tonsils and blocked air passages. Tonsillectomies have been performed since ancient times for one or both of these conditions, but never on the scale introduced in the twentieth century with the advent of general anesthesia for surgical operations. The widespread belief that the tonsils were vestigial holdovers from an earlier stage of evolution combined with the technical means to remove them painlessly, led to an explosion in the number of tonsillectomies. By the 1930’s between one and two million per year were performed in the United States alone. Doctors are pretty well agreed that it is unwise to remove tonsils or adenoids while polio is rampant: within a month or two after such an operation, an invasion by the polio virus is more likely to result in the oftentimes fatal bulbar form of the disease. Last week the A.M.A. Journal called the attention of U.S. family doctors to growing evidence that polio victims who have lost tonsils, adenoids, or both, at any time in their lives, are more susceptible to bulbar and bulbo-spinal attacks. … tonsillectomy is the most frequently performed piece of surgery. Doctors once thought tonsils were simply useless evolutionary leftovers and took them out thinking that it could do no harm. Today there is considerable evidence that there are more troubles in the upper respiratory tract after tonsil removal than before, and doctors generally agree that simple enlargement of tonsils is hardly an indication for surgery [emphasis in original]. Additional troubles in the upper respiratory tract were not the only negative effects of industrial scale tonsillectomy. The medical literature indicates a mortality rate for tonsillectomy of 1 in 1500, usually as a result of complications caused by general anesthesia or other factors not directly related to the tonsils. Recent studies of complications from tonsillectomy indicate a rate of non-fatal complications from tonsillectomy of 2 to 5%. Based on a conservative estimate of 1,000,000 tonsillectomies per year, and using a contemporary rate of 1 fatality per 1500 tonsillectomies, it is reasonable to estimate that during the 1930s 40s and 50s, at least 666 patients died each year in the United States alone and another 2000 to 5000 experienced complications serious enough to require hospitalization, as a result of a tonsillectomy. This amounts to 20,000 deaths and 60,000 to 150,000 hospitalizations between 1930 and 1960 in the United States alone. It is impossible to calculate exactly how many of these incidents resulted from an unnecessary tonsillectomy, but the fact that the annual number of tonsillectomies has dropped by more than 50% since 1960 suggests that at least half of the deaths and hospitalizations that occurred during the heyday of tonsillectomy were unnecessary. If even half of the tonsillectomies performed in the twentieth century were unnecessary, the global cost of regarding tonsils as vestigial organs amounts to no less than tens of thousands of unnecessary deaths and hundreds of thousands of completely avoidable surgical complications. The tonsils are 3 masses of tissue: the lingual tonsil, the pharyngeal (adenoid) tonsil, and the palatine or fascial tonsil. The tonsils are lymphoid tissue covered by respiratory epithelium, which is invaginated and which causes crypts. In addition to producing lymphocytes, the tonsils are active in the synthesis of immunoglobulins. Because the first lymphoid aggregates in the aerodigestive tract, the tonsils are thought to play a role in immunity. Although healthy tonsils offer immune protection, diseased tonsils are less effective at serving their immune functions. A team of researchers monitored the progress of 300 children aged two to eight years, all of whom suffered from recurrent mild throat infections or enlarged tonsils and adenoids. Half of the children had surgery, while the remainder underwent “watchful waiting.” All were monitored for two years. The researchers from the Netherlands found that during the first six months, those who had undergone surgery did appear to suffer fewer episodes of fever, throat infections and upper respiratory tract infections. However from six to 24 months, there was no difference between the two groups. It is now possible to conclude that of the tens of thousands of patients who died (as well as the hundreds of thousands who suffered complications requiring hospitalization) as a result of a tonsillectomy, a large percentage-almost certainly the vast majority-should never have had the operation at all! But the evolutionary presumption that the tonsils developed through random natural processes and served no purpose in the human body was also dangerous for another reason. It shifted attention away from the physiological and environmental factors responsible for the swelling of the tonsils (which in turn led to chronic infection or blocked airways) and pinned the blame for these conditions on an assumed defect in the “vestigial” tonsils themselves. In this way, adherence to the evolutionary hypothesis blinded researchers to the deeper health issues that gave rise to tonsillar disease. the soft tissues of the body grow to their genetic size, even when the bony structures do not. The skin, the tongue, the tonsils and the nasal tissues grow to their genetic size but when the nutrition is missing, the bony structures are compromised. So the face will have an excess of skin and musculature, the tongue and tonsils will be too large for the mouth . . . If Dr. Silkman is correct, the hundreds of thousands of tonsillectomies still being performed each year because of blocked air passages will continue to treat the symptom-the relatively enlarged tonsils-instead of the cause (environmental pollution, lack of exercise and malnutrition) by removing a part of the patients’ already compromised immune system! Abandonment of the evolutionary hypothesis will allow researchers to discard the bankrupt notion of vestigial organs and to search for the causes of illness in dietary, genetic, physiological, psychological, or environmental factors rather than in some postulated intrinsic defect in the human body as a whole or in any of its parts. As noted above, faith in the truth of the evolutionary hypothesis has repeatedly led scientists and medical researchers to believe that organs of the human body that have no apparent function are “vestigial” and expendable. The full extent of the danger inherent in this unproven and unsubstantiated assumption emerged soon after the publication of Origin of Species with the popularization of the concept of embryonic recapitulation by Darwin’s disciple the German medical doctor and professor of anatomy Ernst Haeckel (1834-1919). Darwin had argued that similarities in structure among diverse life forms indicated that they had all evolved from a common ancestor. According to Haeckel, the existence of similarities in embryos of various kinds of organisms proved that the higher life forms “recapitulated” their evolutionary history before birth and that they had all descended from a common ancestor. To make this “proof” more compelling for his contemporaries, Haeckel doctored drawings of the embryos of fish, salamanders, chickens, turtles, rabbits, pigs, and human beings to exaggerate their similarities and minimize their differences. Although Haeckel’s fraud was discovered and exposed during his lifetime, the evolutionary hypothesis demanded common descent, and the concept of embryonic recapitulation continued to exert a profound influence on the study of embryology for many decades. Notice that the early embryonic stages of these vertebrates bear a striking resemblance to each other, even though the individuals are from different classes (fish, amphibians, reptiles, birds, and mammals). All vertebrates start out with an enlarged head region, gill slits, and a tail regardless of whether these characteristics are retained in the adult. Although Haeckel’s distorted drawings do not accompany this caption, the statement falsely gives the impression that human embryos-as members of the vertebrate phylum-possess gill slits. But this is patently false. The pharyngeal arches in human embryos have no connection with gill slits whatsoever but develop into the outer and middle ear, and into the neck bones, muscles, nerves, and glands. Moreover, after the discovery of DNA, confidence in the truth of the evolutionary hypothesis led many evolutionary biologists to predict that similar body parts in diverse organisms would be controlled by the same genes. This, however, proved to be false, as embryologists have discovered that the realization of the same body plan-such as five digit extremities-in diverse organisms (such as whales and humans) is controlled by different genes and is achieved through totally different embryonic pathways. Human embryos pass through a “gill slit” stage. These are “developments in the direction of man,” to use Fr. Rahner’s phrase. Therefore, to accord the human embryo the dignity of a human being from conception is biological nonsense. In reality, of course, the development of the human embryo is quite distinct from that of the other vertebrates in Haeckel’s drawings, and there is no empirical evidence to support the claim that he (or she) passes through any stage that is not fully human, in the biological sense of the word. Although faith in the evolutionary hypothesis has resulted in immense harm to millions of victims of unnecessary tonsillectomies and has demonstrably contributed to the acceptance of abortion and abortifacient contraception, that same evolutionary faith has contributed to an equally serious threat to scientific progress and public health in the realm of molecular biology. It can be demonstrated that faith in the evolutionary hypothesis has delayed the recognition of the functionality of so-called “junk DNA” (or non-coding DNA) and has thus retarded the discovery-and, at least in some cases-the cure of many genetic disorders. The origin of the term “junk DNA” has been traced to a paper by Dr. Susumnu Ohno in 1970 in which Dr. Ohno speculated that just as fossils of extinct species litter the geological record, so DNA that has lost its function litters the human genome. Although some scientists argued that DNA would not have been conserved for the alleged millions of years of evolutionary time if it had no function, the term “junk DNA” began to be widely used to describe the bulk of the human genetic material that does not code for protein. Biologists are wracking their brains trying to think what useful tasks this apparently surplus DNA in the genome is doing. But for the point of view of the selfish genes themselves there is no paradox. The true “purpose” of DNA is to survive, no more no less. The simplest way to explain the surplus DNA is to suppose that it is a parasite, or at best a harmless but useless passenger hitching a ride in the survival machines created by other DNA . . . In 1980 two key papers in Nature combined the concept of “junk DNA” with Dawkins’ concept of the “selfish gene.” Throughout the 1980s, most biologists held that genomes were bloated and littered with an excess of non-functional (non-coding) sequences that had been generated via “selfish” replication. As a result, some questioned the need to sequence or study the so-called non-coding sections of the human genome-then thought to be around 97% of the total DNA. When Robert Sinsheimer, Rene Dulbecco, and Charles DeLisi proposed a project to sequence the entire human genome (subsequently known as the Human Genome Project) many molecular biologists opposed the idea on the grounds that so much “junk DNA” would be sequenced. Sinsheimer’s, Dulbecco’s, and DeLisi’s idea found supporters among a number of prominent molecular biologists and human geneticists-for example, Walter Bodmer, Walter Gilbert, Leroy Hood, Victor McKusick, and James D. Watson. However, many molecular biologists expressed misgivings. Especially through 1986 and 1987, there were concerns about the routine nature of sequencing and the amount of “junk DNA” that would be sequenced, that the expense and big science approach would drain resources from smaller and more worthy projects, and that knowledge of gene sequence was inadequate to yield knowledge of gene function. The Human Genome Project officially began in 1990, and the data it uncovered proved to be quite a surprise. For one thing, far fewer “genes” were found than were expected. For another, the human gene complement was found to be strikingly similar to that of other organisms, like the fly. With the publication of the drafts of the chimpanzee, rat, dog, opossum, and other genomes, it also became evident that the DNA scripts differ mainly in the so-called non-coding regions. Then in 2007, with the results of project ENCODE made available, it finally became clear that the most important factors in genome functioning reside in non-protein-coding DNA. These findings contradicted what had become known as “the Central Dogma” of genetics, namely that DNA produces RNA, which makes protein, which constitutes the significant stuff of organic life. In the double helix structure of the DNA molecule, the chemical bases adenosine, thymine, guanosine, and cytosine, can code for a particular protein, RNA, or binding site for a chromatin factor. In the former case, a multi-enzyme complex copies the sequence of chemical letters on one strand of DNA into a strand of RNA and the non-protein coding parts of the RNA copy are cut out before the coding parts are spliced back together to form “messenger RNA.” After the mRNA leaves the nucleus of the cell, complex molecular machines produce chains of amino acids according to the instructions in the messenger RNA and these chains fold into a precise three dimensional pattern to form the more than 100,000 proteins that make up the human body. The discovery that fully 98% of the human genome did not code for protein forced scientists to look more closely at the “junk DNA” (or non-protein coding DNA). This class of DNA was found to fall into three main categories: pseudogenes, retrovirus-like elements, and retrotransposons. Pseudogenes are alleged to be the relics of genes which have lost their ability to code for protein and which have acquired mutations since losing their functionality. But recent research has found evidence of functionality in pseudogenes. According to a recent article in Nature, a team of scientists at Cold Spring Harbor Laboratory in New York has discovered a function for pseudogenes in regulating gene expression. Researchers have discovered that expression of genes in mouse eggs and very early embryos is activated in part by regions of DNA called retrotransposons, which may have originated from retroviruses. These regions, found in DNA of human, mouse, and other mammals in hundreds of thousands of copies, are called retrotransposons because they have the ability to propagate and insert themselves into different positions within the genome. The research, published in the October  issue of Developmental Cell, suggests that retrotransposons may not be just the “junk DNA” once thought, but rather appear to be a large repository of start sites for initiating gene expression. Therefore, more than one third of the mouse and human genomes, previously thought to be non-functional, may play some role in the regulation of gene expression and promotion of genetic diversity. Dr. Barbara B. Knowles and colleagues from The Jackson Laboratory in Bar Harbor, Maine, found that distinct retrotransposon types are unexpectedly active in mouse eggs, and others are activated in early embryos . . . The researchers think that expression of retrotransposons during very early stages may contribute to the reprogramming of the mammalian embryonic genome, a prerequisite for normal development. One of the pioneers in establishing the functionality of “junk DNA,” Prof. John Mattick, recently claimed that, “the failure to recognize the implications of the non-coding DNA will go down as the biggest mistake in the history of molecular biology.” This prediction will most likely be fulfilled, not only because of the way that the “junk DNA” concept has retarded the scientific investigation of genetic material that does not code for protein, but perhaps more importantly because of the way that the evolutionarily inspired “junk DNA” concept has delayed the medical understanding and treatment of serious genetic disorders. Gene hunters at Johns Hopkins have discovered a common genetic mutation that increases the risk of inheriting a particular birth defect not by the usual route of disrupting the gene’s protein-making instructions, but by altering a regulatory region of the gene. Although the condition, called Hirschsprung disease, is rare, its complex genetics mimics that of more common diseases, such as diabetes and heart disease. Far from being a problem, the finding is good news, he suggests. “Mutations in the protein-coding sequence can’t really be fixed, but those outside the protein-coding regions — perhaps we can fiddle with them, perhaps they are ‘tunable.’ The protein should be fine if we can just get the cells to make the right amount,” he says. Faith in the evolutionary hypothesis and its concomitant concept of vestigial organs retarded medical research into the functionality of the appendix and the tonsils, thus contributing to millions of unnecessary surgeries, tens of thousands of unnecessary deaths, and hundreds of thousands of unnecessary complications requiring hospitalization or medical treatment. In the same way, the evolutionarily inspired concept of “junk DNA” has unquestionably retarded the understanding and treatment of a host of diseases caused by factors other than protein-coding genes. In all of these cases, the belief that random natural processes over long periods of time produced biological entities with nothing more than “vestigial” functionality led to a lack of interest in (and funding for) studying that functionality. Are Human Beings Genetically Modified Organisms? Unfortunately for the human race, in the year of Darwin faith in the evolutionary hypothesis poses a potentially more extreme threat to scientific and medical progress than ever before. The final section of this paper will examine the effect of adherence to the evolutionary hypothesis on the development and use of genetically modified foods and the consequent dire threat to global biodiversity. As noted above, the central tenet of evolution is that all living things have developed from non-living matter through natural processes over long periods of time. Biological evolution not only requires that the machinery to produce RNA and DNA developed through natural processes in the realm of non-living matter, but also that new information entered the genomes of the first living organisms so as to code for the development of new organs and biological systems in their descendants over the course of time. The problem with this requirement is that no observation in nature or in the laboratory provides any evidence for it. As noted elsewhere in these proceedings, population geneticists have spent decades studying the ways that genetic information is transferred from one organism to another in nature. They have observed and engineered combinations of existing genetic information; they have elicited or triggered the expression of genetic information; and they have observed or engineered mutations. But in none of these cases has any plant or animal-breeding geneticist ever produced the kind of new genetic information that would represent a step on the way to producing a new organ or functional biological system. The production and use of genetically modified food has been defended on the grounds that all organisms, including human beings, have evolved through random mutations and that therefore a certain number of man-made mutations pose no threat to the survival of the biosphere since man is merely “doing evolution” in the laboratory. Since Darwin, faith in the evolutionary hypothesis has led repeatedly to the presumption that one or another biological entity was “vestigial” and non-functional. Ironically, today, faith in the evolutionary hypothesis leads many researchers to dismiss concerns about the randomness of genetic modifications to plant foods. Indeed, it is logical to argue that if random mutations produced the splendor of the human body, random mutations-guided at least to some degree by human intelligence-should pose no threat to the human race or to the biosphere. Humans are thus natural GMOs [genetically modified organisms] many times over, or Genetic Modification is intrinsically natural, take your pick. Recombinant DNA technology is an inherently risky method for producing new foods. Its risks are in large part due to the complexity and interdependency of the parts of a living system, including its DNA. Wedging foreign genetic material in an essentially random manner into an organism’s genome necessarily causes some degree of disruption, and the disruption could be multi-faceted. Further, whether singular or multi-faceted, the disruptive influence could well result in the presence of unexpected toxins or allergens or in the degradation of nutritional value. Further, because of the complexity and interactivity of living systems — and because of the extent to which our understanding of them is still quite deficient — it is impossible to predict what specific problems could result in the case of any particular genetically engineered organism. (emphasis added). Dr. Lacey rightly points out the danger inherent in randomly reorganizing an organism’s genetic makeup and contrasts the genetic modification of food plants in the laboratory with natural methods of breeding. The mechanics and risks of recombinant DNA technology are substantially different from those of natural methods of breeding. The latter are typically based on sexual reproduction between organisms of the same or closely related species. Normally, entire sets of genes are paired in an orderly manner that maintains a fixed sequence of genetic information. Every gene remains under the control of the organism’s intricately balanced regulatory system. The substances produced by the genes are those that have been within the species for a long stretch of biological time. (In cases where mating is between closely related species, there is generally close correspondence between the substances produced by each.) In contrast, biotechnicians take cells that are the result of normal reproduction and randomly splice a chunk of foreign genetic material into their genome. This always disturbs the function of the region of native DNA into which the material wedges. Further, the foreign genes will usually not express within their new environment without a big artificial boost, which is supplied by fusing them to promoters from viruses or pathogenic bacteria. As a result, these genes operate essentially as independent agents outside the host organism’s regulatory system, which can lead to many deleterious imbalances. GM corn as animal feed may, under special trial conditions, have an influence on the reproduction rate of laboratory mice. This is the result of a study by Professor Jurgen Zentek (Veterinary University of Vienna, Austria), commissioned by the Austrian Agency for Health and Food Safety. While this represents an individual study whose results may not be directly applied to humans, it shows, however, that there is a need for further studies . . . It was the objective of the study to analyze possible effects of GMO corn NK603 X MON810 in long-term feeding trials covering several generations of mice . . . The results show no differences in the feed intake and the weight development of adult animals. Although in one of the trial designs the number of litters and of offspring in continuous breeding of the GMO feed group decreased more than in the control group: In the GMO feed group more females were without litter than in the control group . . . The study shows that multi-generation studies are indeed appropriate to show feeding influences in mice. Similar approaches must analyze whether similar findings can be expected in other animals. According to Prof. Jürgen Zentek, a validation of these preliminary results by further studies is urgently necessary. Adherents of the evolutionary hypothesis believe that new kinds of life-forms, with new organs and new functional bodily systems, evolve through natural selection of new genetic information produced through random natural processes. Inherent in this belief is the conviction that biodiversity increases through evolutionary processes over time. Moreover, since GMOs are alleged to be formed through the same kind of genetic transfer mechanisms that occur in nature and that have driven evolutionary change in the past, the evolutionary biologists who defend GMOs fail to recognize one of the most dangerous aspects of GMO food crops-the threat that they pose to biodiversity. Since GMO food crops are raised on large farms that concentrate on raising large quantities of one or two crops, they tend to drive out small farmers, and reduce biodiversity in the areas where they are introduced. This happens in several ways: first, through the appropriation of large areas of farmland for one crop; second, through the loss of the variety of crops; and third, through the contamination of neighboring fields with GMO seeds. Moreover, in nature, natural selection operates on one plant at a time. GMO monoculture involves induced mutations on hundreds of thousands of plants at the same time, with no natural process of selection. If the evolutionary hypothesis were true, geneticists could anticipate the evolution of some new superior plants. But the reality is quite different. Geneticists now recognize that-contrary to evolutionary expectations-the seeds of food plants that have been used and handed down for many generations contain the greatest reservoir of genetic information, while plants that have been intensively bred for specific characteristics like sugar beets are actually much less robust than the older stock from which they were bred. The preservation of older varieties of food plants becomes particularly important as a defense against plant diseases, since the older varieties tend to be more resilient against a broad spectrum of diseases. In addition, the preservation of a variety of landraces increases the likelihood that one or more of the plants will be able to resist a new disease or natural pest. On the other hand, monoculture, including GMO food crop monoculture, poses a serious threat to the global food supply since farmers who practice GMO monoculture have no plant genetic reserves in the event that a new disease or pest is able to destroy the GMO food crop. Faith in the truth of the evolutionary hypothesis breeds an expectation that new plants and animals will continue to achieve greater genetic complexity through “evolutionary mechanisms” without human intervention. But this contradicts the reality that the variety and genetic diversity of organisms in the biosphere is constantly being degraded over time by habitat destruction and human mismanagement. Thus the evolutionary arguments that David Tribe and other evolutionary biologists use to justify the introduction of genetically modified food crops provide a pseudo-scientific justification for a practice that threatens the whole biosphere. It is important to recognize the common denominator that runs through all of the examples cited from the history of the past 150 years since the publication of Darwin’s Origin of Species. The examples presented here demonstrate that in regard to so-called “vestigial organs,” “junk DNA,” “embryonic recapitulation,” and genetically modified food, faith in the truth of the evolutionary hypothesis has led repeatedly to a presumption that existing organs and biological structures are the product of natural processes working at random-for example through mutations and transfers of genetic information-and that those organs or biological systems that have no apparent function in an organism are expendable and can be removed or tinkered with without harm to the organism or to the ecosystem of which it is a part. It has been demonstrated, however, that this same confidence in the truth of the evolutionary hypothesis has repeatedly hindered scientists and medical researchers from vigorously investigating the functionality of these organs and other biological systems at a great cost in human lives and avoidable human suffering. Again and again, faith in the truth of the evolutionary hypothesis has led scientists to see dysfunction or loss of function where there was functionality, and to imagine order and increasing specific complexity arising from disorder where observational and experimental evidence pointed in the opposite direction. This assumption of dysfunction in nature goes against the traditional presumption in favor of function that has characterized the pursuit of knowledge in medicine and natural science in the development of Western civilization. As the example of genetically modified food demonstrates, the global scientific community cannot afford to be shackled any longer by the constraints of a bankrupt scientific hypothesis whose fundamental assumptions fly in the face of reality. The experimental research of Guy Berthault and other sedimentologists has called into question the assumptions upon which the geologic time scale was established. Cf. GUY BERTHAULT, “Experiments in Stratification Do Not Support Evolution,” A Scientific Critique of Evolution, Sapienza University, Rome 2009. CHARLES DARWIN,The Origin of Species by Means of Natural Selection, or the Preservation of Favored Races in the Struggle for Life, Penguin, London, 1985, p. 429. Gray’s Anatomy “The Large Intestine” http://education.yahoo.com/reference/gray/subjects/subject/249 (accessed 12-27-08). HENRY L. BOCKUSENRY , M.D., Gastroenterology, 2:1134-1148 (chapter “The Appendix” by Gordon McHardy), W.B. Saunders Company, Philadelphia, Pennsylvania, 1976. DENNIS P. BURKITT, “The Aetiology of Appendicitis,” British Journal of Surgery, December 2005. Time magazine, “Tonsils & Bulbar Polio,” Monday, Apr. 12, 1954. In the United States, “about one in every 15,000 tonsillectomies ends in death, either from the anesthesia or bleeding five to seven days after the operation.” http://www.surgeryencyclopedia.com/St-Wr/Tonsillectomy.html (accessed 12-28-08). DR. AMELIA DRAKE, “Tonsillectomy,” http://emedicine.medscape.com/article/872119-overview (accessed 3-10-09). B. VAN STAAJI, E. H. VAN DEN AKKER, M. M. ROVERS, G. J. HORDIJK, A. W. HOES, and A. G. M. SCHILDER, “Effectiveness of adenotonsillectomy in children with mild symptoms of throat infections or adenotonsillar hypertrophy: open, randomised controlled trial” British Medical Journal. 2004;329:651 (18 September), doi:10.1136/bmj.38210.827917.7C (published 10 September 2004) http://www.bmj.com/cgi/content/full/329/7467/651?view=long&pmid=15361407 (accessed 3-10-09). RAYMOND SILKMAN, DDS, “Is it Mental or is it Dental? Cranial & Dental Impacts on Total Health,” http://www.westonaprice.org/healthissues/facial-development.html (accessed 3-08-09). Cf. MICHAEL K. RICHARDSON ET AL Anatomy and Embryology, “There is no highly conserved stage in the vertebrates; implications for current theories of evolution and development,” Vol. 196, No. 2, Springer Verlag, Heidelberg, Germany, 1997, pp. 91-106. GAVIN DE BEER, quoted in “Homology: A Theory in Crisis” JONATHAN WELLS and PAUL NELSON http://www.arn.org/docs/odesign/od182/hobi182.htm (accessed 3-08-09). Cf. “So Much ‘Junk DNA’ in our Genome,” Brookhaven Symposium on Biology 23: 366-370. Stanford Encyclopedia of Philosophy, “The Human Genome Project” http://plato.stanford.edu/entries/human-genome/ (accessed 3-08-09). “Genius of Junk (DNA),” Catalyst, Thursday, 10 July 2003, http://www.abc.net.au/catalyst/stories/s898887.htm (accessed 3-10-09). “Diabetes and Heart Disease,” Post Genetic Diseases Website http://www.junkdna.com/junkdna_diseases.html#details_of_list (accessed 3-08-09). Cf. MACIEJ GERTYCH, “Race Formation and Mutations Do Not Constitute Steps in Evolution,” A Scientific Critique of Evolution (Rome: Sapienza University, 2009). DAVID TRIBE, “Natural GMOS Part 18,” Thursday, May 4, 2006 http://gmopundit.blogspot.com/2006/05/natural-gmos-part-18-happy-birthday.html (accessed 3-08-09). Cf. JOE CUMMINS, “The Fate of Food Genes and the DNA CpG Motif and Its Impact,” Toxicology Symposium, University of Guelph, March 3, 2001.